“All indications are favoring a time of new awareness. Seek new outlets for your creative expression. This heralds the beginning of a new phase in your life. Ganesha is asking that you take time to reflect on your desires and dreams. It is tie that you begin down the road of a new creative endeavour. Ask Ganesha to help you uncover the desires of your subconscious mind and then follow any creative nudges you feel. You may experience them as innovative sparks that come to you unexpectedly. This momentum will start you down a path that may involve a view of the world. Reflect on your past endeavours. Take time to acknowledge and understand your lessons and your blessings. Feel gratitude for the path that has led you to this point in time. You are receiving the gift of freedom to choose what you will pursue. Tomorrow we step through the portal to a new month. New energies, new possibilities, new beginnings. Anything is possible. 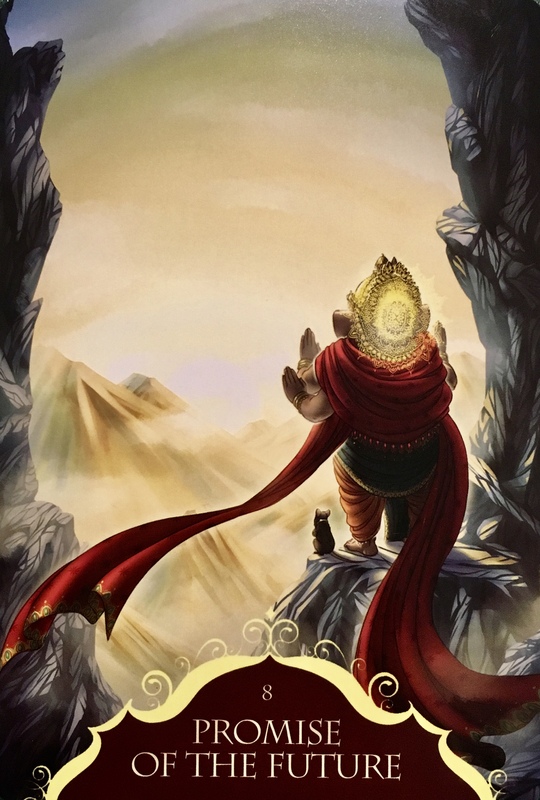 See yourself as Lord Gansha, standing on the edge, the darkness behind, and the bright new future ahead. Feel the radiant light gentle pulling you forward through the portal; know that there is something really special on offer here. There is deep soul love waiting for you, will you open your heart and accept it? There is connection beyond what you have previously experienced. It would have been out of your comfort zone, but now you are ready, you cannot imagine settling for anything less than honouring someone on a Soul level. There is healing available, you will be the facilitator of this. A deep emotional healing and releasing of the old as you step through. Leave the old baggage behind, you won’t need it where you are going, it’s too heavy, too old. There is a new opportunity, project, career, promotion or raise available. But you have to see it to grasp it. You have to jump on it and do it with conviction. There’s no time to sit on the fence and ponder, just get in there and get into it! Do it with your heart and soul and you cannot go wrong. Trust. When we walk through the portal of August, we are entering a powerful time. How it plays out will be up to you. Take the path in the direction that your heart leads you and open a whole new chapter of your life.